Harry Marinsky, painter, sculptor, illustrator and designer, was born in London to Russian émigré parents who were both designers in the high fashion industry. When his parents settled in England they took the name “Marinsky” from the famous Mariinsky Theatre in St Petersburg, a name they knew the English would recognize and associate with artistic endeavor. Harry Marinsky came to the United States as a young man and studied at the Rhode Island School of Design and the Pratt Institute of Art. By the age of twenty-eight, he was art editor of the magazines American Home and Country Life. Although he first won acclaim for his accomplished watercolors, Marinsky became a noted sculptor. In 1972 he moved to a farmhouse in the Italian village of Capriglia, near Pietrasanta and the celebrated Tomassi Foundry where he produced many works in bronze. He was active as a sculptor until his death at the age of ninety-nine. Marinsky was a member of the Artists’ Equity Association and the Silvermine Guild of Artists. In 1944 he exhibited for the first time at the Art Institute of Chicago, in 1943 at the Museum of Modern Art in New York City. He had his first one man show at Madison Square Garden in 1946, followed by other one-man shows at Silvermine, Eggleston Gallery, and the Bodley Gallery. He also exhibited at the Whitney Museum of American Art, Rhode Island Museum of Art, and the Montross Gallery. 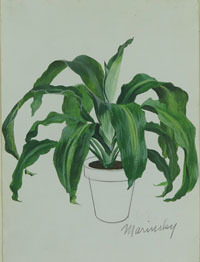 This watercolor was done circa 1960 as an illustration for The Woman’s Day Book of House Plants published by Simon and Schuster. Many of his original watercolors of plants are in the Hunt Botanical Library at Carnegie-Mellon University. Signed in pencil, lower right: "Marinsky"